First, make the salsa. Finely chop the green tops of the spring onions, reserving the white parts for later. Mix in a third of the tomatoes, the avocado, ½ the chilli, finely diced, and lime zest. Season and set aside to marinate. To hot smoke your salmon, take an old biscuit or chocolate tin, or a wok and make a little grill to sit inside it using chicken wire or a metal trivet. Scatter the wood chips on the bottom with 1 tbsp water and the remaining chilli, cut into chunks. Brush the salmon with a little of the rapeseed oil and place on the rack. Cover with the lid. Cook on a BBQ or on your hob (if inside open your windows and put on your extractor fan) for 8-10 minutes or until just cooked throughout. Set aside and keep warm. For the oatmeal, heat the remaining rapeseed oil in a frying pan and fry the sliced whites of the spring onions for 1-2 minutes. Add the oatmeal and cook for 3-4 minutes, stirring until golden and toasted. Turn off the heat and stir in 150ml water and the lime juice. Fluff it up with a fork and stir in the remaining tomatoes. 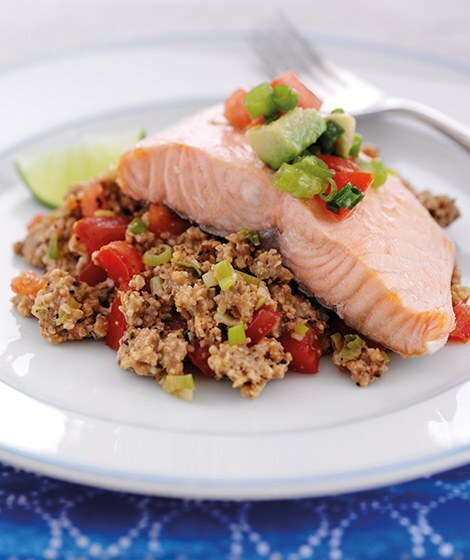 Serve the salmon fillets on a bed of the oatmeal with the salsa. A brilliant way to use old chocolate or biscuits tins. If you don’t have one knocking around, you can also cook this really easily in a wok with a lid.